Time magazine released a poll taken October 9 and 10 which supposedly indicates that Occupy Wall Street movement is approved by twice the number of American adults than is the Tea Party by a measure of 54% to 27%. Even if we ignore the obvious bias in the wording of the questions, can we give any credence to Time magazine’s conclusions? The Occupy Wall Street movement is the creation of a Canadian magazine titled Adbusters. 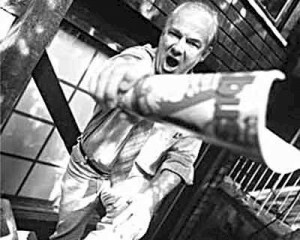 Adbusters is a counter-culture magazine which promotes anti-consumerism, and is the brainchild of Kalle Lasn whose goal is “We want to wreck this world.” Occupy Wall Street is made up of an amorphous group of students, dopers, and hangers on looking for the main chance. Their main theme seems to be to “Eat the Rich,” but they seem to have no plan for what to do after the meal has been consumed. They are opposed to bank bailouts and capitalism without realizing that with true capitalism and free markets, mismanaged banks would be allowed to fail. Bank and automobile manufacturer bailouts have more in common with socialism than with capitalism. 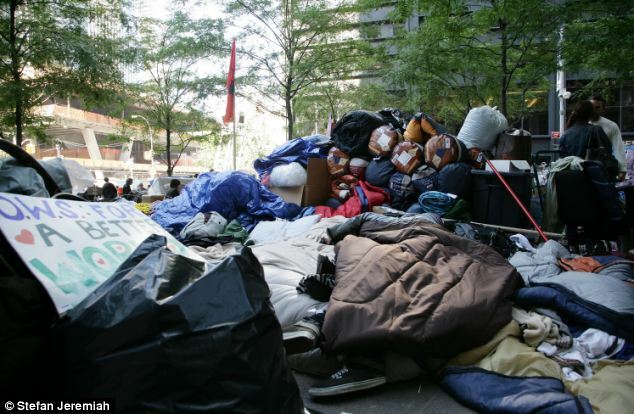 The current occupation of Zuccotti park in New York and the satellite protests in other cities have been marked by confrontations with police, the accumulation of trash, the consumption of drugs as well as drum beating and shouting. In Boston a uniformed, female Coast Guard officer was accosted and spit on by protesters. If you only received your news from the mainstream media, you would believe that this is a mass movement rather than a collection of a few hundred ne’er-do-wells . Diane Sawyer of ABC was so enthusiastic about the Occupy Wall Street crowd that she claimed that the movement has spread to more than a thousand countries. What? A thousand countries? At last count, there were less than 200 countries in the world. But the Occupy Wall Street protest does have it’s lighter side. There was this guy there and he knows what he wants. He has convinced himself that someone, anyone else should pay his tuition. When pressed for a reason why his tuition should be paid by someone else he admitted it was “Just because…it’s what I want.” That simple but honest response describes the entire Occupy Wall Street farce. That brings us to the Tea Party movement. It is a movement that coalesced about the simple but powerful idea that government should live within it’s means. Truly a radical notion in 21st century America when government deficit spending is the norm. The motivating force behind the Tea Party movement was the obscene levels of spending that Obama and the Democrats in Congress put in place. In his first months in office, Barack Obama signed into law a $862 billion bill that was laughably described as “stimulus.” He then signed an Omnibus Budget Bill for 2009 that included 9000 earmarks. The Tea Party movement came together to declare enough is enough. They saw their children’s and grandchildren’s inheritance being squandered to suit the desires of this generation. It became a national movement that included millions of Americans. The Tea Party held rallies nationwide. 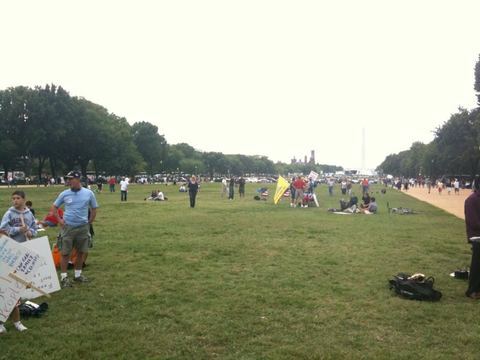 The rallies were always orderly and the Tea Party members cleaned up after themselves. Tea Partiers do not believe it is fun to provoke confrontations with the police. The Tea Party members revere the Constitution of the United States. They do not consider it to be a list of suggestions and agree that “That government is best which governs least.” The Tea Party members do not despise capitalism, but they do despise crony capitalism. They do not believe that the government should be selecting winners and losers by bailing out some and letting others fail. Then came the midterms in November of that same year. The Tea Party was active nationwide and the results they obtained were astounding. Two Tea Party candidates, Marco Rubio and Rand Paul sailed to victory in their US Senate Races, and in the House, Republicans picked up a net of 63 House seats, stunning the Democrats with the extent of their loss. Not every Representative who won in 2010 was a Tea Party candidate, but many of them were. So that brings us back to the original question. Is the Occupy Wall Street movement more popular with Americans than the Tea Party movement? The answer to that question can only be determined in an honest poll with unbiased questions, but more importantly it will determined by the number of candidates who publicly seek the endorsements of each group for the coming elections and the actual results of the 2012 elections.